Breaking Bad is ending this Sunday. I would talk about it, but I’m pretty sure I’ve got nothing new to say about it that you don’t already know. I love the show, I will miss it, but I’m glad it’s ending. Go out on top. I drew this as a celebration of the show, and also because I was inspired by my pal Jason Young. He drew a series of 12 trading card sized portraits of the major players from the show. They are all available for purchase on ebay, and you should buy them because they’re great, Jason’s great (and could use the income) and Breaking Bad is great. I like great. 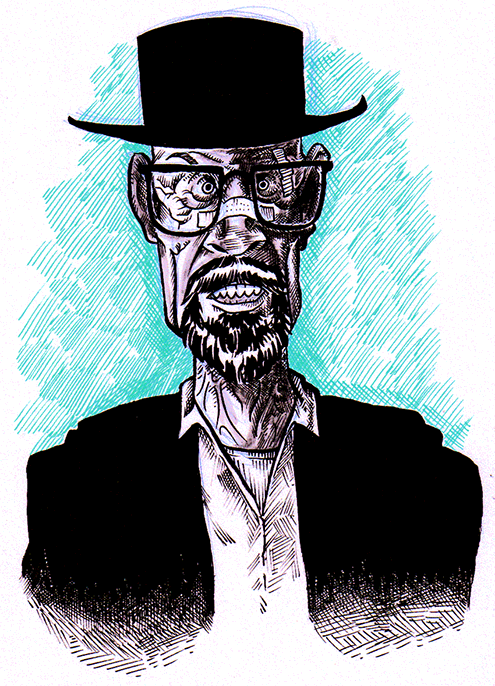 And also Heisenberg. I’m at a point in the show (near the end of season 2) where I’m starting to actively dislike Walter, and to not enjoy the experience of watching the show. Stupid drugs, screwing up people’s lives. This is way more amazing than my Breaking Bad cards… but yes, people should still buy them. And yes Joe, drugs are bad. Please keep watching. As Walt becomes more and more deplorable, the show really becomes about Jesse and Hank. And yet, I still find myself rooting for Walt as he continues his descent. This is an amazingly crafted piece of fiction.